We believe ... that reaching out to others is our best method of communicating the Good News of God's love as seen in Jesus Christ. We support...through our mission dollars and volunteer activities, a variety of programs and services that help people in our community and throughout the world. If you have been looking for a way to get involved and to help others, we invite you to join us in one or more of our areas of service and mission. July/August Focus July/August Focus Schools out for the summer! Yes, the kids are getting out of school, looking forward to swimming, hanging out, and maybe a summer job. But all too soon it will be time to think about gathering school supplies, finding a book bag, and heading back to class. A project that started as a way to help homeless and impoverished students at Loch Raven High School now also serves those in need at Parkville High School and Pine Grove Middle School. 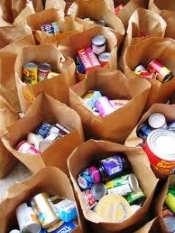 The Student Support Network helps students struggling every day with the effects of poverty by donating food, clothing and personal care items; basic items they and their families often cannot afford. A high school student who does not have to worry about hunger, dirty clothes, or not having deodorant, toothpaste or shampoo is a student much more capable of concentrating in school. May Focus: Bread for the World is a collective Christian voice urging our nation’s decision makers to end hunger at home and abroad. By changing policies, programs and conditions that allow hunger and poverty to persist, Bread for the World provides help and opportunity far beyond the communities in which we live. Each year MPC sponsors an Offering of Letters. On a special Hunger Sunday we write letters to our members of Congress urging their attention to issues affecting the hungry both in the US and abroad. February Focus: Cecile de Sweemer, MD, PhD, is a member of MPC and an activist missionary with Butoke, a community development agency in the Democratic Republic of Congo. She alerts the congregation to specific needs requiring Christian advocacy, action and/or support (e.g. money for seeds to grow food for malnourished families) and the church encourages support from church members as well as from others. 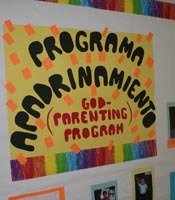 October Focus: MPC has a sister parish in El Salvador. Delegations from the church have shared visits with brothers and sisters in the parish, Maria Madre de los Pobres, for mutual faith support and to help with goods and services to empower them to meet their challenges. Delegates often say, "It is not what we take to our friends in Madre, it is what they give to us to bring back." Our donations for this mission go specifically to the Escuela Abierto, "open school," a free afternoon program for parish children. Members and friends of MPC also sponsor more than 20 godchildren through a special program in the sister parish. Sponsorship helps with school fees, medical needs, glasses and dental care, and emergency funds for children. This past year, MPC initiated a Christmas Mission Gift to the Adult Day Program, which provides a safe place to spend each weekday, a healthful meal, and meaningful activities for elderly people who have few resources. The sister connection with Maria Madre de los Pobres is a mission at the heart of the church's commitment to its core values of love and social justice for our sisters and brothers in need. March: With its mission "to save the greatest number of children's lives at the lowest possible cost," the Child Health Foundation provides services nationally and worldwide. CHF's focus is on such low-cost, highly effective health issues as oral rehydration therapy, breastfeeding, immunizations, and bed nets. Clean water is another health priority in developing countries: MPC paid for installation of a village tube well in Bangladesh. Members of the church's Mission Committee devote many hours helping to fulfill this mission. April Focus: We contribute to the local and worldwide programs of the mission agencies of the Baltimore Presbytery and the Presbyterian Church (USA). A gift to One Great Hour of Sharing enables the church to share God’s love with our neighbors-in-need around the world by providing relief to those affected by natural disasters, provide food to the hungry, and helping to empower the poor and oppressed. Presbytery of Baltimore, Uptown Ministry Group/Habitat for Humanity/McCabe-Woodbourne Community Association Project – Since 2014, this partnership of our local Presbytery ministry group, Habitat for Humanity of the Chesapeake and Strong City Baltimore have worked in the McCabe Avenue area of North Baltimore. During that time, twenty-two MPC members, family and friends ranging in age from 17 to 90 have participated in 19 Habitat workdays and 20 homes have been completed. Complementing the Habitat rehabbing effort is our partnership with Strong City Baltimore, a community organization that takes a holistic approach to building and strengthening Baltimore’s neighborhoods. As the Community Organizer since 2015, Christian Hall works with the Woodbourne-McCabe Neighborhood Association to determine what the neighborhood needs, and realize those needs by partnering with local groups, including the Upper Metro Ministry Group. Together, their accomplishments include: improving safety by lobbying for and having speed humps installed on McCabe Avenue; supporting a food pantry at Walter P. Carter Elementary School; working with the Glenwood Life Counseling Center to install a community vegetable garden on Glenwood Avenue; and for the children, sponsoring annual events such as summer camp and back-to-school and Halloween parties. For the last two years many of us have participated in the summer camp, which will be held again this year. January Who are the people, and what are the places, organizations, and experiences that have kindled a fire within you that motivate you to move our world from the way it is, to the way you believe it should be? What formed the cold determination within you that gets you up each morning to try and be a Disciple of Jesus Christ by loving your neighbors? These are powerful questions, and connecting to these stories of who we are can unleash a power that has the ability to transform our congregation, our community, our county, Baltimore City, and the State of Maryland. To do any of that, we are invited to discover the stories of our faith and our lives that can give us strength when we’re not sure if we are enough to be the people God is calling us to be in the world. In January, our Mission Focus will be on Community Organizing, a way for us to be relevant and involved in the life of the community past our doors on Sunday morning. It’s a way to shape the world in the shape of God’s presence in our life together. We’re asking you to offer something a little bit different this month. We will have envelopes in the pews for you to offer funds that will help us to show up in Alhambra Park for our pop-up games of kickball, board games and coloring in the neighborhood, but also so that we can create events where we can learn what our neighbors, young families, immigrants, environmentalists, folks who live around us would love to see a church lead the community to address. These events don’t cost much. We will also use the funds to bring trainers in to train those who participate in our Lenten Study how to practice Holy Listening with one another, and folks we’re just getting to know. Holy Listening is sometimes called having a Relational Meeting, similar to how I have been meeting with folks at MPC and the area to learn about you, and deepen our relationships. There is something powerful about knowing one another’s motivations, concerns, passions, and dreams for a world transformed. Now’s the time for us to practice Holy Listening, because the Go-Between God of the Incarnation is inviting us to hear our calling to be a revitalized little church in the woods. I hope you will join us in this exciting work.